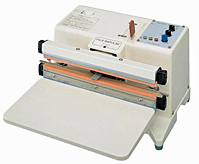 The Tabletop Vacuum Sealer V-300 incorporates a vacuum mechanism into the great features of FS-315. With a self-contained vacuum pump, this compact, economical commercial sealing machine delivers exceptional performance and only requires a 110V outlet. V-300 vacuum sealers effectively preserve freshness, prevent oxidation, conserve sensitive electronic and medical diagnostic parts and stop shifting of contents. With an automatic timer controlling vacuum and sealing temperature, this sealer maintains uniform vacuum sealing for a prolonged operation. The V-300 is one of few food sealers that can be used in both seal-only and vacuum-seal operations and changed from one to the other with a simple nozzle setting. A dual-heating sealer model, V-300-10D, is available to accommodate thicker films or heavy foil gusseted pouches. Compact, Rugged, Light Weight and Portable: Takes up minimal space and very mobile. Designed for desktop operation. Built-in Vacuum Pump: Exhaust speed and ultimate vacuum represents stand-alone values. Dual Modes: Vacuum & Seal or Seal-only mode to change with simple nozzle setting. Sealing width: Changeable between 5 mm and 10 mm with the change of the heating element.